Advising and Student Transitions helps students develop their academic programs. 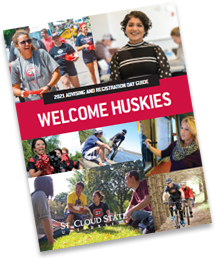 New first year & transfer students can register for our Advising & Registration Program and Huskies 1st Four Days, programs designed to support your success! You’ve got specific questions about advising, majors, and resources. We’ve got answers! Explore information for St. Cloud State students who are returning to school after a break in their enrollment.